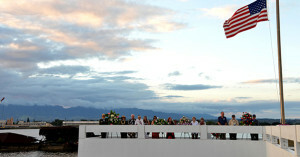 USS Utah survivor Gilbert Meyer (second from far right) stands aboard the USS Utah Memorial during a sunset service on Ford Island. Navy Region Hawaii hosted the event to remember those who served aboard the Florida-class battleship and to honor the 58 crew members still entombed aboard the sunken vessel. Dec. 7, 2016, marks the 75th anniversary of the attacks on Pearl Harbor and Oahu. The U.S. military and the State of Hawaii are hosting a series of remembrance events throughout the week to honor the courage and sacrifices of those who served Dec. 7, 1941, and throughout the Pacific theater. As a Pacific nation, the U.S. is committed to continue its responsibility of protecting the Pacific sea-lanes, advancing international ideals and relationships, well as delivering security, influence and responsiveness in the region. The hour-long ceremony is held at sunset each year to commemorate the anniversary of those who bravely served on the Florida-class battleship, and to honor the 54 crewmembers still entombed aboard the sunken vessel. On Sept. 14, 1941, USS Utah sailed to Pearl Harbor, where it provided anti-aircraft and target duties. USS Utah was moored on “battleship row” when Japan attacked Pearl Harbor on Dec. 7, 1941. “I think it’s incredible to be standing here, where it took place 75 years ago. It’s unreal knowing that you’re standing where the events took place such a long time ago,” said Rios. Before his opening remarks, Pearl Harbor survivor Liaison Master Chief Jim Taylor was overwhelmed by the turnout and thanked everyone for showing up. Taylor then went on to speak of the bravery of the men and the toughness they needed to have in order to survive. The Utah was struck by multiple Japanese torpedoes and quickly capsized. The partially submerged hull of the fallen vessel, with the remains of many of her crewmembers, lies silent in Pearl Harbor to this day. 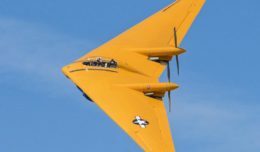 Like the ships of today, the Utah provided valuable service in training naval aviators and enabled the U.S. Navy to test, hone and build its operational capabilities. Despite being located in an area not easily accessed by the public, Sailors still take the time to visit the USS Utah Memorial. The ceremony concluded with a bugle rendition of “Taps,” played by Hodge, and a wreath floral tribute presented by the ceremony’s official party. The sunset service is part of a series of remembrance events hosted by the U.S. military and the State of Hawaii held Dec. 1 -10 to honor the courage and sacrifices of those who served Dec. 7, 1941, and throughout the Pacific theater.